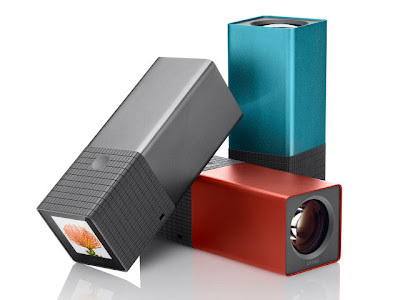 Chech this video out it's a demo & introduction to the Lytro camera. Believe me. YOU WANT TO SEE THIS VIDEO. I've pretty much lost my patience in carrying a bulky DSLR around with me wherever I go & tired of getting suspicious looks from people. For a while, I have been looking for a compact camera (since I don't have a phone camera & may not be getting a smartphone in 1-2 years). That's when I discovered the Lytro camera. Don't like the shape. Don't like the colours. It's a bloody ugly camera, I know. Bulkier than a phone in the pocket (but I guess it's made for school girls who carry handbags & update FB like every second). But for RM1600 (US$499) or RM1300 (US$399), I can take pictures without the hassle of focusing or worrying about blurred/overexposed/underexposed/noisy images. Image capturing is instant & I can focus AFTER taking the picture. This is how the camera works: Instead of merely capturing the light that touches the sensor, this camera also captures the direction this light comes from. This allows calculation of where the light will be if the sensor is moved forwards or backwards: thus, the post-shot focusing. The picture resolution might be low: meaning smaller pictures only worthy of FB/personal viewing. Apple like business model: meaning everything is centralised. Lytro pictures are edited & shared through the Lytro website via flash. No mention of whether the pictures can be edited locally on a computer. It is currently only available for MAC users & only in the US but such a revolutionary piece of technology will pretty soon be available all across the world. They're also working on a windows version. Once it is out next year, I'll wait a while for people to try it & share about it on the net before I decide on getting one. Besides, the technology might still be too young to be worth the hefty price. Meanwhile, this year's expansion to my photographic repertoire will be a speedlight. I've been wanting to get one for a long time. It will probably help me take better pictures. I complain about bulk & yet I'm going to add even more bulk to my DSLR by purchasing the Nikon SB-900 speedlight at RM1600 (US$495).